Fresh Chefs is teaming with Center for Child Protection and bespoke Food Austin to provide food for graduating foster youth in Central Texas! Antonelli’s "Cheese 101" classes are an intimate way to get to know the "7 Styles of Cheese." They guide you through each style of cheese and taste specific examples (both pasteurized and unpasteurized), accompanied by olives, nuts, and Easy Tiger bread. They also bring out a number of additional pairings like chutneys and charcuterie bites, depending on that evening's cheese selection. The best part? You get to indulge and feel good about it. This class is their Charitable Cheese Cause Class of the Month - and in October, they’ve chosen us! Fresh Chefs Spotlight in March at Hearth and Soul! During the month of March, a local retailer, Hearth and Soul will be spotlighting our work and donating a portion of sales to support Fresh Chefs Society when you purchase a beautiful candle of their chosing. Hearth and Soul is a gathering place and shopping experience where you can discover beautiful things for yourself, your home or someone special in your life. Our curated collection of simple, modern and classic items, including top brands and artisan goods, will both warm your heart and feed your soul. Our floor plan is carefully designed to feature each room of the home; including the Women’s & Men's Closets, Family Room, Dining Room, Kitchen & Bar, Pet Corner, Library, Bed & Bathroom, Patio and more. This special space is also created to delight and simplify your life by hosting community events, providing design services and offering a modern gift registry. Apprentice Class of 2019: Menu Planning and Cooking on a Budget. The Apprenticeship Program is a six-month program that introduces youth to the full spectrum of the food service industry and provides on-the-job training experiences in a variety of settings. Each Fall, we invite youth who are interested in learning more about the food industry, to apply and participate in a supportive and interactive interview process, obtain their food handlers certificate, assistance in resume building, public speaking experience, and exposed to environments where dining and food are central to social interaction. Apprentice Class of 2019: Cooking is therapy. Fresh Chefs has run on nearly 100% volunteer power until now. It’s high time to invest in our inaugural Executive Director in 2019, and to do it having a very good time indeed. A new leader will bring more programming to more youth and create more meaningful connections and conversations around dinner tables across Central Texas. So, come explore a wild and happy array of flavors from some of Austin’s favorite chefs and from Fresh Chefs Apprentices throughout the evening. Bring old friends and make new ones. Take home an experience, gift card or product donated by our generous business and food community through our signature silent auction table. Most importantly, help support Fresh Chefs Society’s mission to empower youth in foster care through food. VIP Reception admission: $150. Join us an hour before for a special reception and early access to the silent auction table. After six months of cooking, learning, eating, foraging, chopping, eating, sautéing, growing - and, eating - our second apprentice class is ready to graduate! We'll celebrate their accomplishments over treats and give them their very own kitchen start-up kit! Fresh Chefs will host a cooking demonstration for a group of all-star youth - former and aging out foster youth who inform the Department of Children and Families Protective Services on how to improve the foster care system here in Texas. To celebrate and showcase the apprentice's talent, JW Marriott Austin is hosting a dinner at their downtown location, where supporters and apprentice guests can enjoy an eclectic buffet and hear from the youth about their program experience. The Art of Institute of Austin is excited to host an evening of great food to benefit Fresh Chefs Society. Culinary students will showcase the skills they've perfected over the course of their education in a pre fixe five-course meal. The night will begin with a cocktail hour that will include signature cocktails and light hors d'oeuvres, 5:30 pm - 6:30 pm, and then transition to dinner at 7:00 pm. Tickets are $45.00 and can be purchased here. Join us for evening for an evening of culinary celebration and support foster youth in Austin! Change1, an Austin-based non-profit young people who age out of the Texas foster care system to adulthood by planting a new way of thinking, one of hope, possibilities and purpose, is a favorite of Fresh Chefs's. They are hosting their 4th Annual Thanksgiving Celebration on Saturday, November 18, 2017 at ACC's Eastview Campus. The celebration is open for all, but the guests of honor are the youth in care. To register and find out more information, click here. The 2018 Fresh Apprentice Class kicks off in January! We are so excited to interview and welcome our second group of apprentices. If you want to learn more about the program, please join us for an information session at Settlement Home. Calling all chefs, restaurants, caterers, bakers, food artisans! Interested in learning how you can be more involved in our work? Join us! Enjoy delicious food and beer specials while learning more about Fresh Chefs. 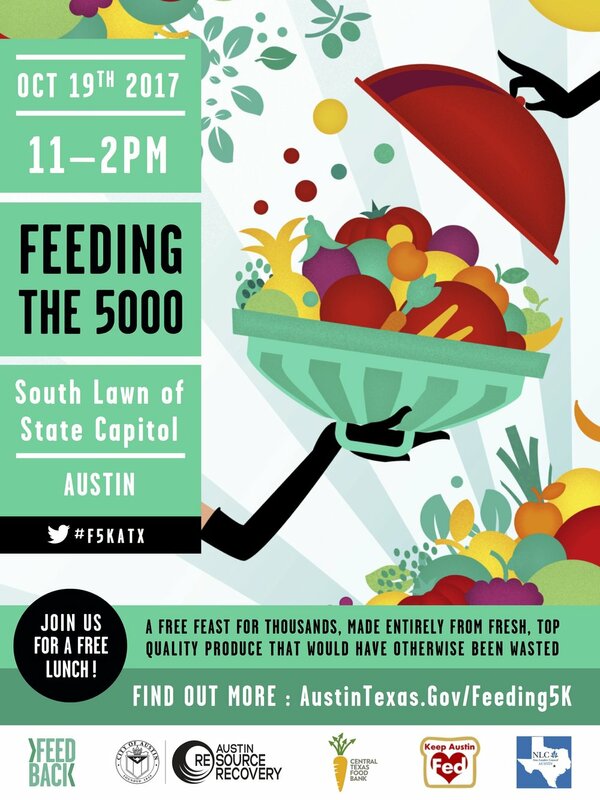 Austin will take food that would have otherwise gone to the landfill and serve a delicious, communal feast for 5000 people. Fresh Chefs apprentices will work with the team at Bonneville to prepare the feast! CDMX in ATX! On Monday, August 28th, La Condesa Austin will host its first annual collaboration dinner with guest chefs from Ciudad de Mexico. Explore the diverse flavors of our southern neighbor with a seven-course menu created by the La Condesa team and guest chefs Joaquin Cardoso and Sofía Cortina of Hotel Carlota. Lucky us, after the night's over, La Condesa will continue to offer a dish from this special menu with a portion of proceeds to benefit Fresh Chefs! Special thanks to Executive Chef Rick Lopez for thinking of us as the beneficiary for this exciting collaboration! Space is limited.